With all those blogs, I made the right call. They weren’t on topics that interested me enough to stick with them for good. They weren’t “me”. It definitely didn’t help, though, that as I lost interest, I barely posted at all. However much you love your blog’s topic, you’re not going to get far if you don’t blog consistently. You get out of the habit of writing for your blog, and feel a lot of resistance towards getting going again. You lose any momentum you’ve built up – your readership and traffic levels may not drop dramatically, but they’re certainly not growing. You feel discouraged, and eventually, give up on your blog. That might be a deliberate decision to stop blogging, but more often, it just happens. You don’t blog for a few weeks … then a few months … and eventually you realise you stopped years ago. Of course, the easy answer here is to just blog regularly – every week, or twice a week, or three times a week – without fail. But it isn’t really as easy as that. Life gets in the way, for one thing – even the lovely bits of life. In the past six years of blogging on Aliventures, I’ve had two house moves, a wedding, two pregnancies, two babies … none of which have exactly been conductive to the smooth running of the blog. And for many bloggers, writing itself is hard at times. Perhaps you struggle to stay motivated, or you never seem to have any ideas. Even when life is going reasonably smoothly, it can be incredibly hard to stick with your blog, week in, week out. One of the key things that helps me is to have a clear blogging workflow. In the past – particularly pre-kids – I just wrote posts on the days when I wanted to publish them. That works well for some bloggers, but for me, it became all too easy to let busyness take over. #1: While you’re working through this plan, it’s okay to hit “pause” on your blog. Don’t worry about publishing new content until you’ve got well ahead with ideas and plans. If you leap back in too soon, you’ll just end up back at square one. #2: Feel free to tweak this plan to suit you. I’d definitely recommend giving it a go as-is to begin with, but if there’s something that isn’t quite right for you or your preferred way of working, feel free to improve on it! You might want to leave a comment below to let us know what you’ll be changing, in case your tweak would work well for someone else reading. You might, for instance, decide that you can spare 45 minutes every morning before heading out to your full-time day job. This is how I got my freelancing career launched, way back in 2008. If weekdays are just too manic, you might set aside two hours on Saturdays and two hours on Sundays for writing content. 6am – 6.45am each weekday morning, before your day job. 15 – 1pm, Mondays, Wednesdays and Fridays. 1pm – 3pm on Saturdays and 8am – 10am on Sundays. 8pm – 8.30pm each night, once the kids are in bed. 9am – 10am every weekday, before you start the rest of your work. This should give you a realistic idea of how much time you’ve got available each week. For instance, if you write for 30 minutes every evening, seven days a week, that’s a total of 3.5 hours. Note: Try to avoid having your writing time only on the days when you want to publish posts. As you work through the plan, the idea is to get ahead with content, so you’re not writing and immediately publishing. Now you know how much time you’ve got available for blogging, you can decide what sort of publication schedule you can reasonably commit to. There’s no “right” answer to how often you should blog, but I think that most bloggers do well posting between one and three times per week. Once every two weeks is okay, though it might take you a bit longer to build up momentum. Make sure you’re giving yourself enough time to write really good posts. Think of this as a reader: wouldn’t you rather read a blog that publishes one great post every week, and leaves you wanting more, instead of a blog that churns out three rushed posts weekly? You might want to occasionally check with your audience that the schedule suits them. When I surveyed the Aliventures audience a few months ago, I found that once a week was just right for the vast majority of readers. If you’ve gone through a dry spell with your blog, it’s probably because you’ve struggled to come up with ideas. To be consistent with your blogging, it’s important to generate ideas ahead of time – so you’re not scrambling to think of an idea and plan your post and draft it and edit it all at once. Coming up with a bunch of ideas all at once is also easier, because you get into the flow of idea-creation. I like to do this on paper: I write “Aliventures” (or a category from the blog) in the centre, then start coming up with ideas around the edges – drawing lines to link them when appropriate. Ready-made titles or prompts. ProBlogger has an ongoing series of these, which you can sign up for here. Another option is to collect great titles from around the web then create your own unique twist on them. Reader questions. Have you had any questions from readers recently, by email or in your comments section? These can be a great source of blog post ideas: if one reader’s wondering about something, chances are, others will be too! If your readers haven’t been forthcoming with questions, you could try looking for your blog’s topic in Yahoo! Answers or Quora. Listing as many ideas as possible. You can do this on paper or at your computer. Just start listing ideas and try to come up with as many as you can (you might want to set a timer for 10 or 15 minutes to keep you focused). Don’t worry about whether the ideas are any good, or whether you can actually tackle them – just get them down. For more tips on coming up with blog post ideas, check out Twenty-Five Ways to Come Up With Great Ideas for Your Writing. Before you start putting your ideas in, you might want to consider having a particular “theme” for specific days of the week or month. For instance, some blogs run a weekly round-up post, like this one on ProBlogger, and others have a regular monthly slot for a larger post or a compilation piece, like the e-Cover design awards on The Book Designer. You can create your calendar in any tool you want: in the past I’ve used pen and paper, Microsoft Excel, Evernote and Trello. There are also WordPress plugins that can give you content calendar functionality on your blog itself. If you’ll be collaborating with another writer or with an assistant, you’ll probably want to have your calendar in some sort of shareable form. 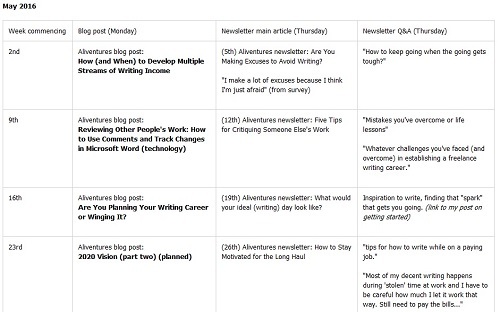 When I sort through my ideas, I use “big” ideas for blog posts (I normally write 1,500 – 2,000 words on these) and “little” ideas for my newsletters (which are more like 300 – 500 words). I also use reader questions for the newsletter, and I plan which ones I’m using for which weeks. Often, I want to make sure I cover a couple of different topics in the newsletter, so that readers who aren’t interested in the main article can get something from the Q&A and vice versa. If I get a question that’s on a broad topic (e.g. 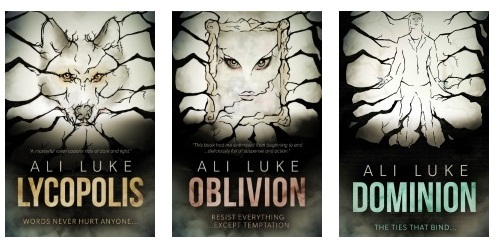 how much to pay for editing and cover design when self-publishing) then I’ll often use that as the inspiration for a full-length blog post. The balance of topics: you probably want to mix things up a bit and avoid having five posts in a row on the same topic (unless you’re deliberately writing a series). The balance of content types: this could mean avoiding having too many “how to” or list posts on a row, or switching between longer and shorter posts. How much research your posts require: obviously, you’ll need to allow time for this, and having several research-heavy posts in a row could make it tough to stick to your schedule. The “call to actions” you want to include: if you want to encourage people to check out your book, for instance, it’ll help if your post topics are related to it. 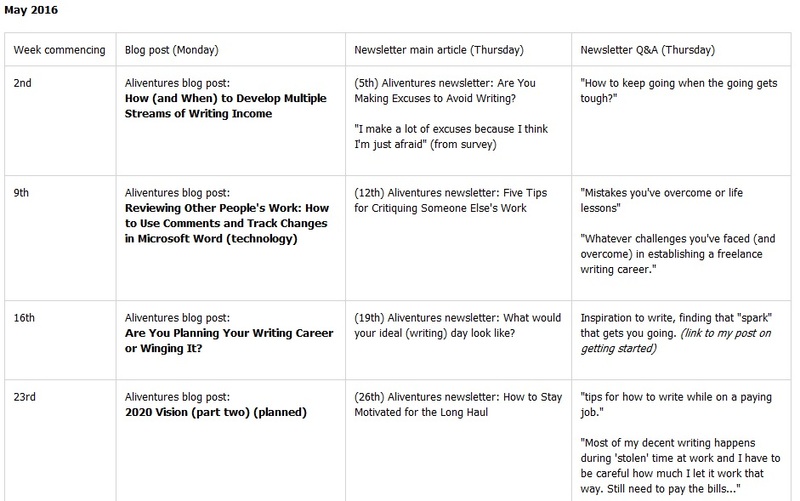 Once you’ve got your content calendar ready for the next month, it’s time to plan out the individual posts (or newsletter articles) that you’re going to write. You don’t have to plan the whole month up-front, before you start on any of the writing, but it definitely helps to batch-plan your posts. Just as with generating ideas, you get into the “flow” of planning – and by planning several posts in a row, you might spot links between them or points that you want to reinforce. There’s no need to plan in great detail: ten minutes per post should be enough, and for short blog posts or pieces of content for your newsletter, you might need less than five minutes. You may find, as you plan your posts, that you change your mind about where to position them on your content calendar. Perhaps a supposedly short piece looks set to be a longer post that you want to put towards the end of the month, so you have extra time to write it. Maybe an idea that you thought would make for a good post would actually be better split into two or three different posts. It’s easier to make adjustments to your calendar now than once you’ve actually written a bunch of content. Feel free to tweak it as much as you need to. Since you’ve planned your posts ahead of time, the actual writing of them hopefully won’t be too tough. You’ve got a head start on the blank page – you can just open up a document (or your blog’s post editor), copy your plan into it, and you’re already underway. When you write a post, don’t feel that you have to begin with the introduction. It’s often easier to dive in at the first main point (or even later on, if there’s a particular section that you want to warm up with … or want to get out of the way). You can come back and add the introduction at the end. Continuing with the theme of batch production, you could draft several posts before going back to edit them all. Again, this can help you to get into – and stay with – the right mindset for each stage of writing. While you don’t have to work through your posts in the order in which they appear on your content calendar, it probably makes sense to work from the start of the month onwards – otherwise, if something happens to derail your writing, you’ll have to re-plan when all your posts are going out. Ultimately, you want to be creating your content at least a week or so before you’re due to publish it: that way, you’ve got plenty of margin for emergencies – and you may find you enjoy writing a lot more when you’re not pressured by an imminent deadline. 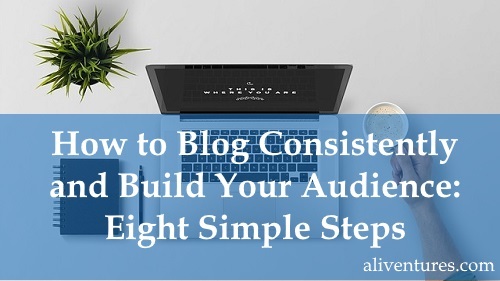 Being consistent with your blogging doesn’t just mean putting out posts at regular intervals. It also means publishing high-quality posts – well-edited ones that readers want to read and engage with. The big advantage of creating a calendar and getting ahead with your blogging is that you don’t need to rush posts out. You’ve got time to plan before you write – and to carefully edit after you write. Before editing, I recommend letting your post “rest” for a day or two. If you write it then immediately edit, it’s easy to miss things – or to get caught up in the details (choosing this word vs that one) at the expense of the bigger picture (maybe your second subsection should be part of a different post altogether). Is the introduction gripping? Could the first paragraph or first sentence be cut altogether – and would the post start more strongly if so? Do the major sections of the post flow sensibly? For instance, if you’ve written a list of tips, is there a logic to the way you’ve ordered them – e.g. easiest to hardest, cheapest to most expensive, the start of a process to the end of a process? Are all your sentences clear? If you had to read something twice to make sense of it, your readers definitely will! Are any words mis-spelt? Are any words too complicated for your audience? Too slangy? Too juvenile? If you’re writing a particular important post – perhaps one that you’ll be linking to a lot from your guest posting, or one that you hope will get significant social media attention – then it’s worth asking a friend to give it a read-through. It can be almost impossible to spot your own typos. This final step is optional, but I think it can be a useful one when you’re trying to position yourself as a consistent, reliable blogger. Let your readers know what’s coming up next. That could mean giving the title of your next post, or giving a brief description of what sort of content you’ll be covering. This way, readers know that you’re not about to disappear on them. They can see that you’re planning ahead – and their trust in you grows as you consistently deliver on what you’ve promised. Blogging consistently isn’t easy. Life’s always going to get in the way – whether that’s the day job, family commitments, or having time to create the products or sell services that your blog exists to market. Come up with ideas ahead of time (you probably only need 20 minutes once a month for this, unless you’re blogging very frequently). Plan several posts at once (try to get 3 or 4 planned in one 30 minute session). Write your posts at least a few days ahead of time, so you can let them “rest” for a day or two before editing them (if you’re struggling to get ahead, post less frequently for a bit). 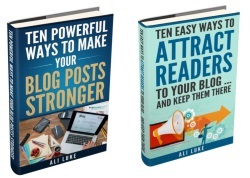 If you’d like more help with building your blog, I’ve got two completely free, just-updated, mini-ebooks: Ten Powerful Ways to Make Your Blog Posts Stronger and Ten Easy Ways to Attract Readers to Your Blog … and Keep Them There. These are available to anyone who receives my weekly email newsletter: if you’re already getting it, just head to this page. You can find the password at the bottom of any recent newsletter email you’ve received from me. I just discovered you over at ProBlogger on your guest post, and I’m so glad I did. This list is particularly helpful because it is so concise and doable. I’ve been reading up on how to manage and build my blog, but there’s so many bits of advice that are lengthy and almost overwhelming. But this! This, I can do. I found your advice on planning blog posts particularly helpful. I don’t have a shortage of blog topics, but I do get “tongue-tied” when I try and decide which type of post to write when. I think the Big Idea advice will be particularly useful. And I feel like an idiot, but the newsletter advice is brilliant. Thanks again! 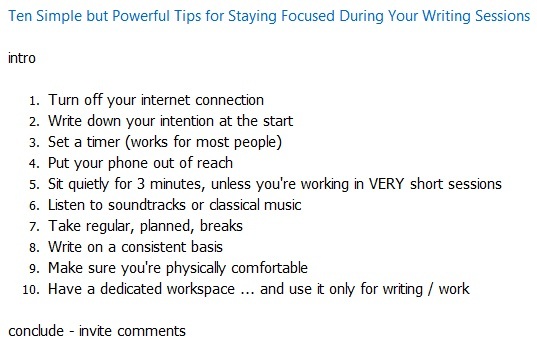 Thanks for this, I especially like the tips on how to stay focused. This is such a crucial issue, and so simple, yet so hard in these times of constant connectivity! I am in my early stages of writing and even setting up my site, so I’ll keep those in mind! Focus is a constant battle, isn’t it? I have to physically unplug my laptop from the internet sometimes, when I want to really focus on writing! I just found you via Michaell Hyatt’s tweet. Currently I write on my mommy day off, Wednesdays & during my daughter’s sports on Saturday (2 hour chunk). I started my blog 2 months ago and currently post 1/week. I have 7 weeks worth written and my goal is to write at least 1 essay/week to keep that margin. Sometimes I worry that I will run out of ideas. Mine is not a how to blog but more of a “personal musings & reflections on life” blog. Welcome to Aliventures, Sarah! That sounds like fantastic progress with the blog (and well done you getting ahead). 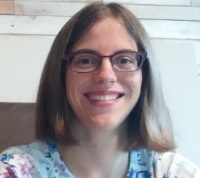 Also, as a fellow mother-and-writer, you might like my recent guest post here on The Write Life about finding time to write as a parent — though from your comment it sounds like you’re doing a great job of scheduling writing in. This is incredibly spot-on. Almost scary — because I’ve been following a similar path and can really relate. I ran multiple authority blogs before I settled with one, especially since my current blog covers similar topics as those other sites I once had (writing/freelancing/blogging, etc). – Posting the latest observations or events within your niche (this one takes a bit more time, but it doesn’t require a whole lot of brain power). The above can help a blog remain updated (to some degree) while still delivering value to my readers. Now, my next goal is to get back on track with long-form content, but your blog post is actually giving me plenty of tips and ideas to go about it. So thank you for that. What great suggestions, Elvis — thanks for adding those! It can be really tough when time is short, and of course plenty of blogs do perfectly well with short, regular updates. I’d not thought of posting and summarising YouTube videos, but I think that’s a fab idea — I’m never too keen on watching videos unless I know they’re going to be valuable, and they don’t always have particularly good notes attached on YouTube. This something that I am practicing on a daily basis. One way I found out what my readers what to learn? Is to simply asking them what they want to learn? I make a quick survey with “Google Forms” on subjects closely related to the niche I am in and send an email to my subscribers. Within a short while, I’ll get a response and can base my content around that. Great tip, thanks Aslam! That sounds like a great way to get to know your readers better and to write the posts that they most want to read.